you'll be at least another year older when you do." Ski Slope Access for Paid Instruction: Many ski resorts in the United States operate on federal lands with exclusive use permits from the U.S. Forest Service. In these cases resorts pay fees to the federal government for the privilege of providing and charging for services on these lands. Often such resorts own land at lift bases where they operate lodging, food service, ski rentals, accommodations, and lift access, but the lifts themselves and the slopes skiers use may be on national forest lands, especially in Colorado and the rest of the West. Thus, while non-ski-school persons may teach others on the national forest slopes, in most cases they cannot legally do so for compensation. In these cases, only the ski resorts can lawfully provide instruction for which a charge is made, which is only fair so they do not have to compete with those who would otherwise avoid the fees the resorts pay. And the resorts do enforce this business practice with security personnel who observe paid on-slope teaching by non-staff or off-duty employees and may take action against violators. In other cases, resorts operate on their own or on leased lands, and may be equally opposed to non-personnel teaching for pay on their properties. 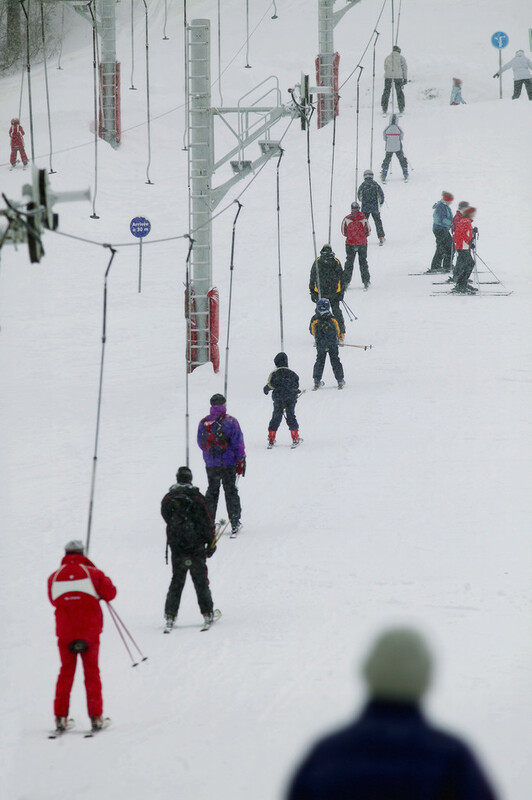 Of course, ski school lanes cannot be used to access lifts by non-staff or off-duty teachers. If a black-market instructor is caught by a resort and removed from the area, a lesson session would be terminated . Even so, the so-called "underground" ski school has existed and may still, but to ask a professional to participate is to ask him or her to risk loss of a career. Too, should there be an injury in an "underground" lesson to the instructor--an instructor might not receive help from a health insurance company, for policies may not be intended to cover pay situations, and there would be no workman's compensation from the resort or a state agency. If there was an injury to a student that might be blamed on the instructor, 'though a case that might not succeed anyway, that student may find suing a person without resources a futile exercise. There could easily be issues with the Internal Revenue Service and the Social Security Administration as well. Finally, an instructor who did teach in the underground found his clientele shrinking and came to work for a ski school where instructors were ranked by the number of students who returned for more lessons. At year end this instructor was at the bottom of that list and is no longer teaching at all. That is who you might get as an instructor who is outside the system, in addition to the other problems above. Please do not ask Bill Jones or any other person to teach outside the established system. The town of Breckenridge has considered adding its own laws to the federal law that applies to the ski area above town. Their reasons include safety of visitors, as stated on September 20, 2012. The Ego Issue: A hard thing for many of us to do is admit we still have things to learn. To learn, we must often first embrace humility. We must get our egos under control and not let these block our willingness to try new things, even after we have failed them once or more. Most learners have this issue, and those skier-learners who should get the most credit are those most willing to lower their barriers to new notions and new motions. We may not look "cool" at first but in time we will look even more cool, should that matter, and we will be more versatile in-control skiers--if we allow ourselves to go through the transition of learning. This is true for ski instructors, too. Once at a professional ski instructors' clinic, the organizer got all the instructors together and said, "Now I want you to go outside and get your skis on. Then when you get in your groups, stand in a circle and each of you reach inside your parkas, pull out your egos, throw them in the snow and stomp on them with your skis. Then go have fun and learn a lot!" A slogan is "Fail 'til you succeed." Accept responsibility! For some fun ways to save face when we fail, and fail we must at least at times, see skier excuses. Control in Skiing Defined: Many skiers come to a lesson with the goal of skiing in control. And for good reason, for few are able to achieve control if this is the definition: Control in skiing is the ability to alter the arc of a ski turn while you are in it. Ways to make skis turn include twisting them with rotation or counter-rotation of all or parts of the body or a mix of both rotation and counter-rotation, deflection off obstacles or resistance, tipping the skis up laterally to cause them to bend and thereby use their designed arc, and leg steering. Rotation/counter-rotation and deflection by themselves do not allow the turn to be changed once it begins, and for that reason are often not good choices: once a turn is started by either of these mechanisms, there is little that can be done to change it. Tipping the skis can be done progressively, however, and the turn changed all the way around. Leg steering (also called "braquage") can also be applied to the degree needed. Both tipping and steering can also be augmented by moving the weight a bit forward (tips grab more and we spin around them) to tighten the turn, or a bit back (tips are freed and tails grip more) to create a wider turn. Because most skiers use a rotation/counter-rotation mix or deflection to turn with, and these do not give control within the turn, they must plan their turns in advance and hope that the requirements don't change once they start around. However, the requirements sometimes do change, and such skiers may get into undesirable snow or bumps or hit a rock they could not see from a distance, or another skier moves into their fixed trajectory and a collision occurs. They are not in control by the definition just given here. Few skiers find on their own about tipping or leg steering or fore/aft weight shifting--unless they have been taught these mechanics in a ski lesson. to use the legs and feet to initiate position changes rather than the arms and shoulders, which is what we usually do when not skiing,. to flex the legs and then extend them to propel the body up and forward, versus, at other times, keeping the torso stable and retracting the legs upward toward it. Most of these movement patterns are opposite to what we use in many other activities (including many of the sports more popular in America), and so in skiing we must develop new ways of moving that replace instinctive patterns. Too, many of these advanced-skiing skills must be done concurrently. Although there are other ways to cause skis to perform that work on gentler slopes and at slower speeds, they generally do not work well or at all in more advanced situations. There is some good news in all this: Some sports and activities impart skills that transfer well into skiing: in-line skating, gymnastics, ice-skating, bicycling, dirt-biking, dancing, and soccer to a degree. Skilled water skiers often learn to snow ski quickly, too, but novice and intermediate water skiers may be inhibited until they learn to "drop the tow rope and stand up". Learn the Basics: Maneuvers learned in ski lessons progress from ones that work best on the simple, leveler learning slopes to refinements that work best on steeper hills. It is crucial to adequately master a maneuver on each slope gradient before moving on to the next. Beginners are often eager to "get up the mountain" with their family or friends and may be inclined to skip over what may seem like baby steps. But if skiers promote themselves upward too soon, they will only have skills designed for flatter terrain, and these skill and body positions require too much muscle use to be efficient and effective on steeper trails. Such skiers, especially at the earlier levels, often have exhausting, humiliating, and even unsafe first-runs down what are classified as "easiest" (green) slopes. One should not, for instance, try anything but the learning slopes until able at least to finish a turn with skis lined up parallel; this gives an opportunity to momentarily be in a more efficient position that gives the body a mechanical advantage to handle stresses. An instructor's task is to encourage patience, especially as the learning skier moves toward the advanced beginner and lower intermediate levels. (This dilemma was put this way once to a skier anxious to start down the mountain from the learning area: "If you are skiing at one mile an hour, and that slope you want to take is 3 miles long", and it is now 2:30 p.m., how are you going to get to the bottom of the mountain before the ski area closes, which is at 4:00? Besides, do you think you can hold a snow-plow position for 3 hours? I can't", said the instructor, knowing the stress the snow-plow puts on the inner thighs and knees.) Studies show that skiers fire their muscles for much longer periods than do participants in most other sports. Instructors have a creed that requires them to serve their guests, and this requires meeting guests' wishes as best they can; but instructors also have a creed to deliver a valid result that will give the guest pleasure and also to minimize risk. When an instructor does not endorse a skier's wishes, it will likely be in the skier's best interest to heed. Most skiers can aspire to reach level 6 or 7 without undue commitment, and some who are diligent can do so within a season. At these levels, which are solid parallel skiing, most of the terrain of most ski mountains can be skied with control, but steep black runs and ungroomed slopes will still pose challenges. Skiers may reach this 6-7 zone of skill, then enjoy their sport for some time, skiing with their friends and generally just being comfortable. But sooner or later many skiers want to go past what has become a plateau in their maneuverability, a rut they want to get out of. Or perhaps they have accidentally gotten onto a steep slope that requires skills above their ability or have come onto a slope with particularly challenging snow conditions. At this juncture, some think again of ski instruction. By now, however, these skiers have likely grooved themselves into habits other than those they should have learned initially and kept using. Often they feel they only need some tips on how to improve the technique they already have. But to move ahead from their plateau usually requires fundamental retooling with learning new ways to move the body. Fortunately, such retooling can be done, although often with temporary confusion (the brain and muscles will still want to do things the old way) and resistance to change and the time it takes to make change happen. But in time the new methods begin to work better than the older ones, and positive reinforcement follows. Still, it would have been easier and quicker and probably cheaper to continue with lessons from the start. These ideas are well covered in Lito Tejada Flores' book "Breakthrough on Skis" and subtitled "How to Get Out of the Intermediate Rut". As the old saying goes, doing the same thing over and over again and hoping you'll get a different result is the definition of insanity. Goals: When you set your initial goals in skiing, which like most goal-setting is a process with continual revisions, consider how far you eventually wish to get. Coaching at a regular rate along the chosen journey will likely be useful if not necessary. Practice on your own, too, but be consistent with the ultimate technique objective or your muscles will only be learning less useful memories. Remember the football coach who observed that "Practice does not make perfect." "Oh," queried the listener, "then what does make perfect?" The answer, said the coach: "Perfect practice." If you do set a goal to ski diverse snow conditions and terrain, how soon should you move off the easier, groomed slopes? You should continue to learn on terrain comfortable enough to perform your maneuvers effectively, in balanced body positions. But in spite of the importance of perfect practice, you need not become expert on your current terrain before attempting the next step up. You may be ready for a move up; how will you know unless you try? Too, until you move up, you may not realize the importance of some aspect of the moves you are practicing. Often it is useful to try a more challenging slope (or preferably a more challenging section of your current terrain), feel what is needed, and then come back to the lesser slope and practice with renewed zeal the thing needed for the tougher slope. The same applies to bumps and powder. You should not avoid these too long, or you will become too grooved into a narrow style of skiing, whereas a diversity of skills and movement patterns is what you will need to ski varying slope and snow types. By level 6 or 7, to ski easier bumps and powder should have become part of your goals, and there should have been exposure already to easier examples of each. Keep safety in mind, however, when exploring new challenges of steepness and conditions: you don't want to interrupt your learning cycle. Again, an instructor familiar with the mountain and with your skills pool can help you identify the terrain or snow texture you may be ready to try. How many lessons? : The number of lessons you take depends on your interest and goals as well as your time and money and of course your aptitude. Even the best skiers continue to take lessons; maybe that's why they are the best! Ski racers, too, are coached continually. The U.S. Olympic Team has coaches. One cannot practice well without continued coaching, for we cannot adequately assess our own movement patterns. 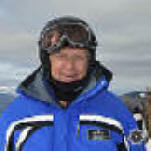 Bill Jones, ski instructor and author of this website, continues to train, as do most ski instructors. Weather, snow conditions, and Success: We cannot control the weather, but the weather can control us. Our ability to master many skiing skills is highly influenced by the weather at hand as well as the snow we are sliding on. We can work around most weather conditions with proper clothing, goggles, and use of warming lodges. Snow condition is another matter. Ski resorts groom the snow surface nowadays to almost "patty-cake" conditions. But even with modern machinery the snow is not always the best for learning. Hard snow or ice make learning more difficult and deeper powder will hinder many at early stages of skiing. I do not necessarily advocate not taking lessons during such times, but if you have options in your scheduling and can be present at times of better snow conditions (snow surface is smooth and an edged ski will produce a groove in it), you will likely make faster progress in learning new maneuvers. Utilizing an instructor trained and certified in the above process will make it more certain for you to get the most effective learning experience. You can also expect to find consistency in teaching methods and progressions from one PSIA-certified ski school to another should you ski in different areas. There are, however, fine instructors who have not been certified by PSIA, and if you find such a skilled teacher you will likely learn well; the challenge is identifying one. Private vs. Group Lesson: Private lessons may be more costly than group lessons (see Book a Ski Lesson with Bill Jones for sample private lesson prices), and so a cost-benefit question arises in choosing which to take. Part of the answer to this question depends on one's personal finances, priorities, and how one values time. There is also a social issue in terms of whether one wants or does not want interactions with others in a learning situation. Because of these considerations, ski schools offer both private and group lessons, leaving you to decide your preference. Whether you take a private or group ski lesson, let your instructor know your current skills and goals so he or she can develop a coaching strategy to achieve them. This is where you make your "contract", and your instructor may appropriately demur if a goal appears unattainable. Divulge inner secrets, too, such as fears, body parts that are not fully functioning, recent injuries, and the like. Your instructor needs to know these limitations so he can select learning drilsl you can do rather than suggest ones you can't. In a private lesson setting, the coaching strategy can be tailored just to you. The private lesson format can minimize distractions or delays from others as might occur in a group, but it does not otherwise shorten the time needed for an individual to acquire a given skiing skill. A "private" lesson can include several persons, becoming a "semi-private" lesson. At some resorts there may be a smaller add-on fee for the extra persons, but in this way you can actually construct your own group if you wish. Such a session will more closely resemble a group lesson and of necessity and to maximize safety must most closely address the terrain and learning needs of the least skilled person(s). An alternative is to have the instructor work separately with each of the skill levels in the group (assuming none are beginners or lower level skiers) while others take practice runs. For a private lesson, you can also request a particular instructor by name (this is best done in advance with a reservation to ensure availability) or ask that an instructor with particular characteristics--such as skill or certification level, personality, or almost whatever you like, be assigned. And although you can make requests for particular instructors in a group lesson, it may not be possible to meet your request because ski schools give priority to requests for private lessons and even to other assignment needs. Family Private Lesson--a special case. The family private lesson may include children of varying ages plus adults. This arrangement is a compromise in learning, especially for any adults in the lesson because younger children learn differently from older children and both learn differently from adults and often by necessity must be catered to, but it does provide a way for families or like groups to share their time. (In group lessons, persons are arranged by age and ability levels.) While having adults present to help with children--arranging their clothes, explaining preferences, trailing the group and helping fallen children get back up--parents often have difficulty in refraining from instructing even though the ski instructor should have this task. Helping parents are not likely to understand how best to instruct skiing and may suggest methods and procedures are not consistent with the instructors' plans. Consider this phrase describing a pastor--“who passed up many opportunities to come to a conclusion”. Reminds of a constant challenge in ski teaching when the instructor tries to balance dealing with variable personalities, learning styles, slope and traffic conditions, weather factors, creature needs, keeping attention, having fun, and even presenting something to be learned—all to make it come out even at the end of the session at the bottom of the hill at the appointed time--and still do a wrap-up so folks might feel they got something for their time, trouble, and money before fleeing off to collect kids, meet others, get thawed out, sip a beer! Reservations: Some resorts take reservations for group lessons; most take reservations for private lessons and honor requests for particular instructors for private lessons. There may be cancellation fees--up to the full amount of the first day of the lesson--if you later decide not to take the lesson, for the resort may not be able to fill the canceled slot after the cancellation although could have had not the spot been reserved. Cancelling a lesson that has been reserved for a particular instructor may likewise impact that instructor's wages as most only get paid when they work, a factor that might make that instructor less likely to want you for a client. But my friend/mate/relative says he/she can teach me as well or better than a ski instructor and save me all that money besides: If so both of you are most unusual. Likely your friend/mate/relative is a better skier than you, but has he/she been trained to teach skiing, or to teach anything for that matter? (For instance, people learn in different ways--visually, by feel, and/or by hearing/understanding; and it is important to teach to the preferred learning style.) If you decide to have your friend/mate/relative teach you, are you able to put yourself in a student role with him or her? In most cases, the reality is no. Typically, friends and mates and relatives are anxious to enjoy skiing with you on the slopes they enjoy skiing and so are eager to have you work on the techniques they now use, overlooking your need to start at the beginning. As a result, friends and mates and relatives often take their companions onto slopes too advanced, with frightening and humiliating results that may even be unsafe. (If you are the would-be teaching friend/mate/relative, are you willing to accept the responsibility for a preventable injury to your buddy?) Friends and mates and relatives want their companions to succeed and often hold them in high enough regard to mistakenly believe that they should excel, and quickly. Instead of launching a new activity to share, the opposite often results. The good news is that many realize the situation and head for ski school rather than giving up the enjoyment that could have come from learning a new sport to share. A ski instructor manages several variables for his charges: selecting progressions of drills to enhance skills at particular levels, addressing psychological attitudes about risk-taking, considering preferred learning styles, responding to weather factors, factoring individual physical abilities, building on prior athletic strengths, and choosing terrain that will allow success--along with timing and meeting individuals' goals. Still not convinced? Then go to this underlined link: "Teaching someone to ski?" In my own case, after over 60 years of skiing, the only serious injury I ever had was on my first trip when my buddy showed me how to ski! I dislocated a shoulder that had to be repaired surgically. Compare that to the cost of a ski lesson. And I still hadn't learned how to ski. Why don't I just use this website--or some other reference--to learn to ski? Even if you could remember all that is presented in such materials, you would not be able to apply with accuracy just what you would need just when and where you need it or just to the degree you'd need it. You'll still need a coach to help you do that. A major part of the reason for having an outside pair of eyes is that you cannot see what you look like while skiing, and yet our minds can trick us into thinking we are doing a move one way even though we are doing it another. Neither will you be experienced to select the most appropriate terrain for your learning, an absolutely vital ingredient for success. See Ski Magazine for November 2013,page 60, for this how-to on skiing powder like the pros in 3 minutes! To be fair, it is likely that an already-accomplished skier could gain new insights from this article on technique that might improve his or her powder skiing. It is O.K. to add to one's understanding from printed material, but for most of us we also need to have an outside pair of eyes check what we are doing and let us know what to change. And more than 3 minutes to do it in! Practice may not make perfect: It takes perfect practice to make perfect. So, after taking lessons, continue the movements learned until they are part of your skiing patterns. It is too easy to go back and ski the way you did before the lesson; avoid it. Have a professional check on you again to ensure you have not strayed and to bring you back on track if you have (a probability). 1. People learn most when they are talking, not when they are listening. So, talk in your lesson; ask questions, relate successes and failures and confusions. 2. More of certain types of learning can take place when one tries not to teach. Your instructor may suggest a "free" run, for this reason; be receptive. Odds are you'll be attempting what you have just been working on and will be more playful than when "under the lens" of your teacher and/or peers--and will probably be more successful. 3. Some things are learn-able, but not teachable. Such as the sensation of control while sliding, although this can be set up by an instructor with your participation. 4. Everything we try works. But some things work better; seek those even though they may be harder at first. 5. What is true for children is probably true for adults too. Often true; you can even think and do like a child for results. 6. We think we learn from our failures and other people's successes, but it is the other way around. It is hard for us to accept our failures due to the ego factor but we can see what causes others to fail; we love our successes and like to be told of them and will therefore add them to our systems. 7. We grow from calamities, not from virtues. Overcoming difficulties is part of life and we are better for it; same in skiing, but as in life we must persevere and will grow if we do. 8. Don't try to improve people, improve the situation. In better situations--easier slopes, clearer explanations, greater attention-- people then can improve. Can you, too, find ways to improve your learning situation--avoid the cell phone, point out your need for rest room or warming-hut stops, get adequate rest the night before, refuel the body with food, manage your fears? 9. Students can learn more from each other than from the teacher. We respond best to our peers, not our superiors; join in to sessions where you are paired with another lesson-taker. Observe their progress and failures and consider their questions and comments. 10. We learn to ski in the summer and swim in the winter. Somehow we retain over the summer what our bodies learned to do in our skiing from the prior winter and are often better at the sport the next winter; so be patient with your progress, for your breakthrough may not come until the following season! Participate all the above ways, but surely perform the maneuvers repeatedly for best results. The ten worst listening habits in America--and how to correct them for a more effective ski lesson. Communication is a two-way street. Listeners can get more out of the time invested listening by correcting any of the 10 worst listening habits in America they may be afflicted by. On the other hand, speakers should assume their audience is afflicted by all of the habits and make their presentations that much more effective and forceful. 1. Calling the subject uninteresting. Listen attentively for information. Be selfish in listening for things you can use. 2. Criticizing the speaker's delivery. Accept speech, grammar, and delivery defects by listening around them. 3. Becoming over-stimulated on an objectionable point. Hear the speaker out instead. Don't let a point of disagreement block your thought process. 4. Listening only for facts. Absorb the underlying principles as well. 5. Trying to rigidly outline every speech. Instead, listen for awhile. Then take summary notes. And, you can't outline the un-outlinable. 6. Faking attention. Listening is an active process, not passive. Gazing steadily at the speaker, possibly with head cupped in palm, apparently in rapt attentiveness, often is indicative of a mind "out to lunch". 7. Tolerating or creating a disturbance. Avoid extraneous stimuli. Quell it if possible. For instance, a lift ride could be used by the instructor to give needed verbal explanations saving on-slope time or by students needing to communicate with friends or family. 8. Listening to the fun material only. Listen to the thought-provoking material also. 9. Allowing loaded words to form barriers to listening. This is much like number 3 above, but is concerned with a single word that has an undesirable connotation to the listener. Granted the speaker should not have used it had the effect been known, but why should the listener miss subsequent points because of the speaker's error, perhaps unwitting? 10. Wasting the differential between talking speed and listening speed. We talk at 100-125 words per minute. We listen at 400-500 words per minute, and we think at about 750 words per minute. Unless the spare time is used profitably, we soon tune ourselves out and start thinking about an entirely different topic. To avoid this, run mentally ahead of the speaker and anticipate coming points. Identify evidence the speaker uses. Engage in mental recapitulations of what has been said. This "Why Take a Ski Lesson from a Professional" page last modified 05/14/2018. Did you come here from a link on another website? For latest version of this page, copy to your browser: http://www.SkiMyBest.com/skiless.htm. Copyright © 2013, 2014, 2015, 2016, 2017, 2018, 2019. William R Jones.